Config (StageNow and RD) - The setting information entered in the StageNow Config section is stored within StageNow barcodes, NFC tags, and/or an audio file. 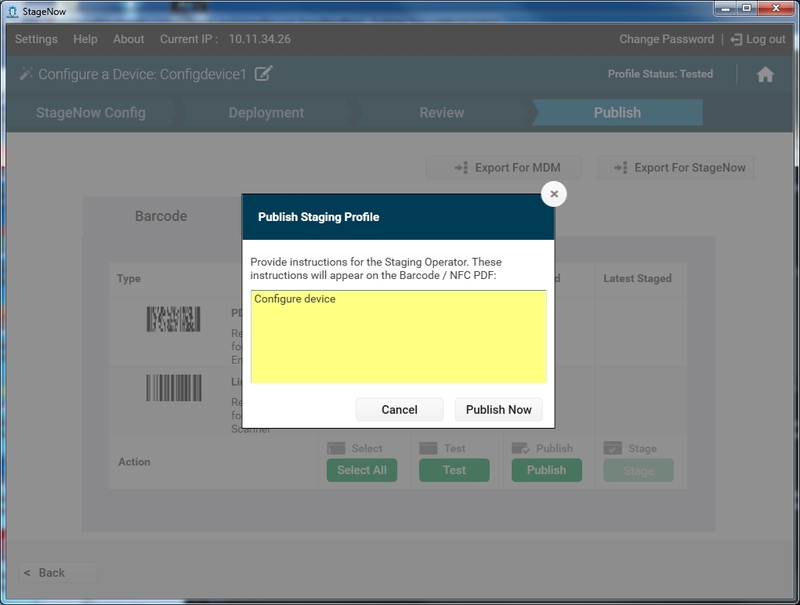 The setting information entered in the RD Config section is stored within RD barcodes. 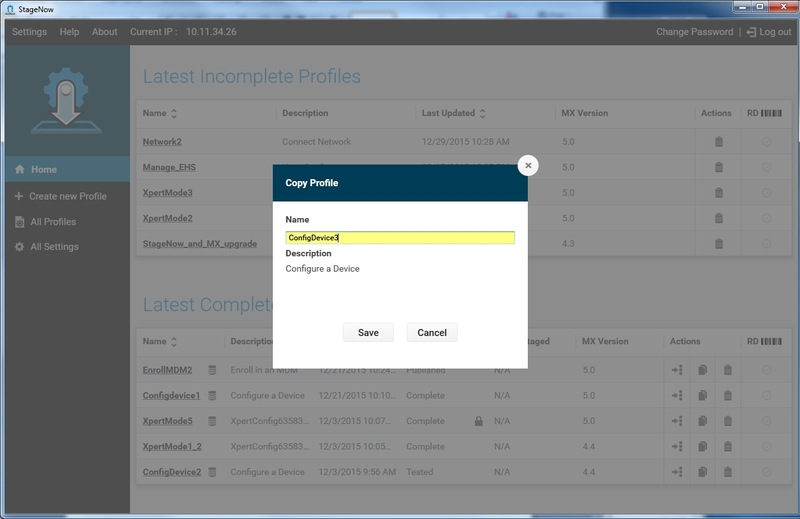 Note that the RD Config section only appears if you turned on Legacy Mode in the Settings screen. The amount of settings created in this section affect the number of barcodes and/or NFC tags that the system generates later. 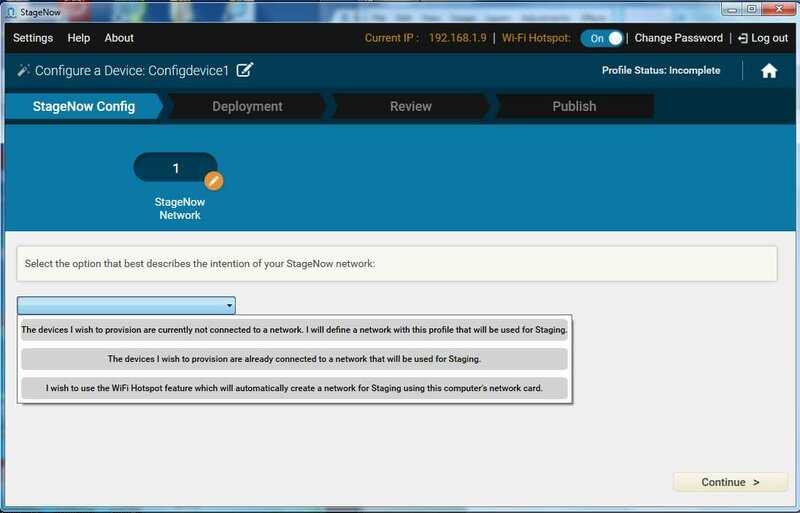 Deployment - This information includes settings that do not reside in StageNow barcodes, NFC tags, or audio file, and is represented as a file on the StageNow deployment server and so requires network connection. 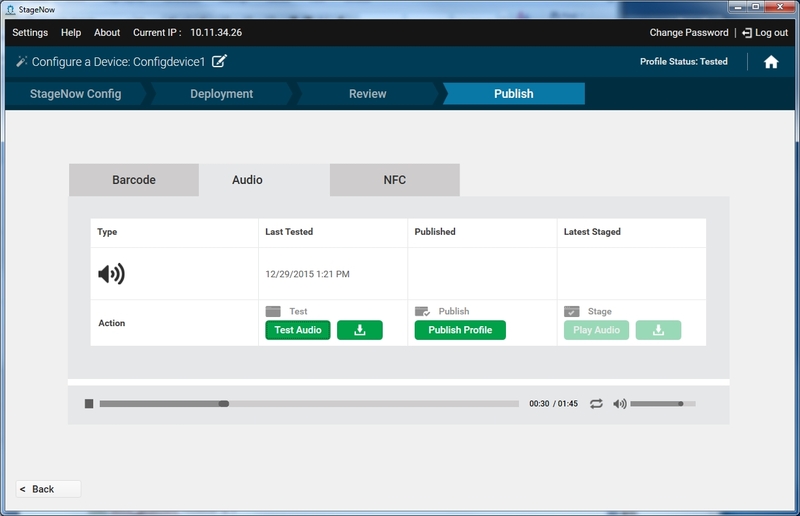 Reading the barcode or NFC tag, or playing an audio file created in the Config section connects the client device to the server and points to this file for deployment. 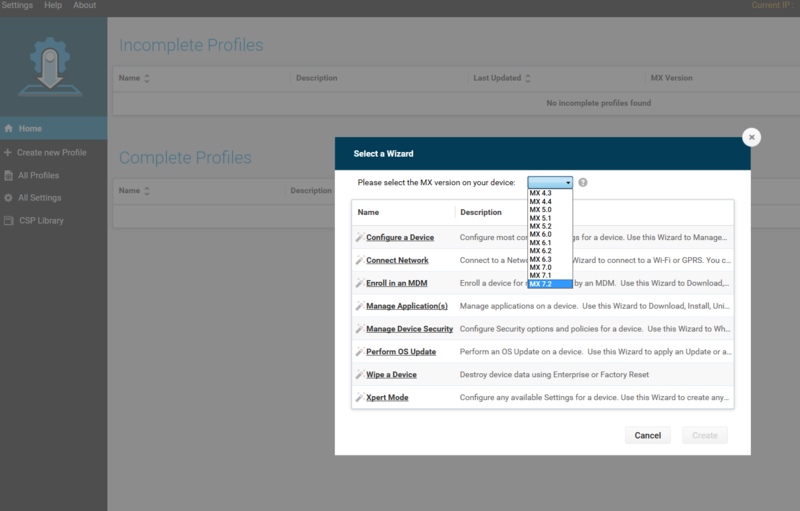 Note that this section does NOT appear in the Connect Network, Manage Device Security, and Wipe a Device Wizards. 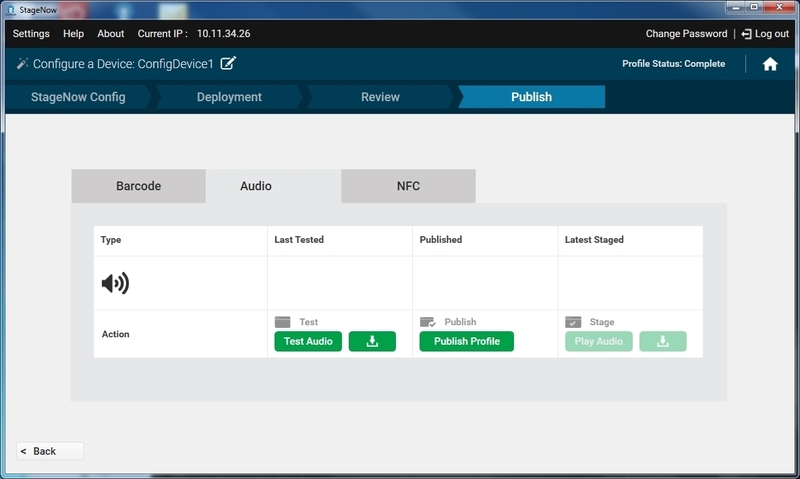 Publish - The Publish section allows the administrator to select the method of delivery (linear barcodes, PDF417 barcodes, NFC tags, or Audio file) for the completed profile, as well as test, publish, and stage the profile. Staged - The operator has acquired the profile, i.e., generated barcodes, exported data to write to an NFC tag, or downloaded the audio file for staging the device. "The devices I wish to provision are currently not connected to a network. I will define a network with this profile that will be used for staging." 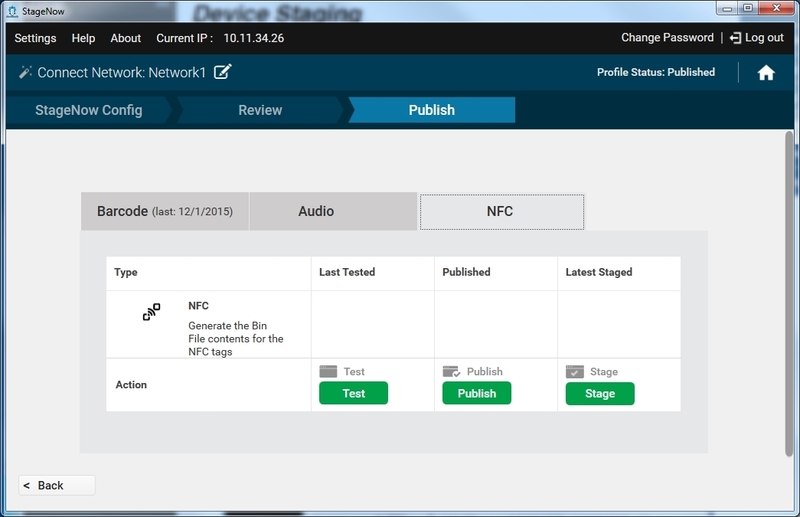 "The devices I wish to provision are already connected to a network that will be used for staging." "I wish to use the WiFi Hotspot feature which will automatically create a network for staging using this computer's network card." 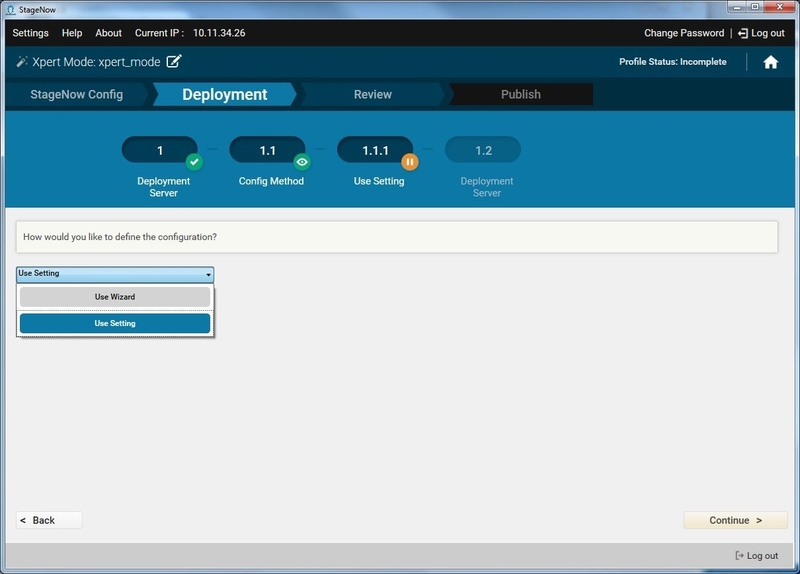 The second and third options above are supported only by Wizards that use the Deployment section of the tool. StageNow 2.9 and higher supports plug-in CSPs, accessed by selecting CSP Library from the StageNow Home screen menu (below). 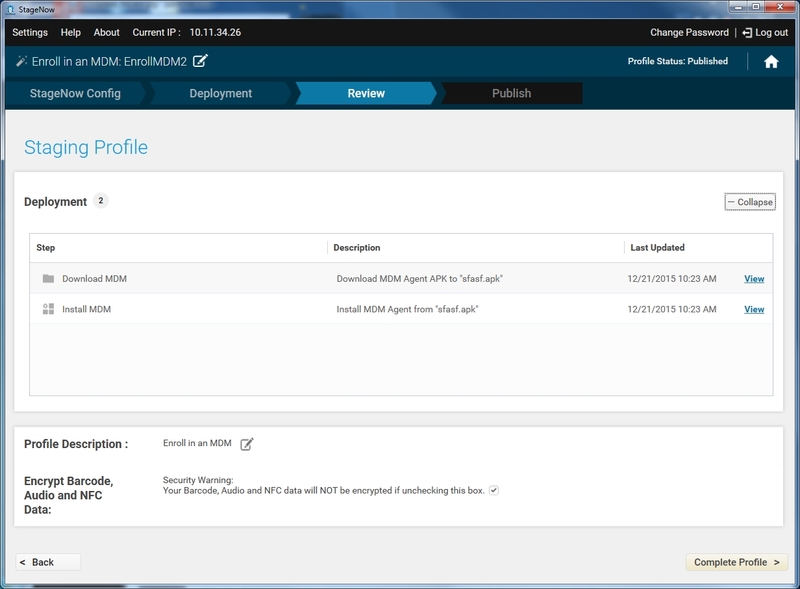 Use the Deployment section of the Wizard to specify the subset of the settings that define what the profile does, and store these settings on a deployment server. See the specific Profile Wizard for instructions. Note: This section is not available on some Wizards. Encryption for staging data is selected by default in order to protect the sensitive data encoded in the profile barcode or NFC tag. See StageNow Encryption for more information. De-select this checkbox if necessary to save space. The Publish section of the Wizard permits selection of a staging method, testing of the method for profile functionality, and making the profile available to the staging operator. 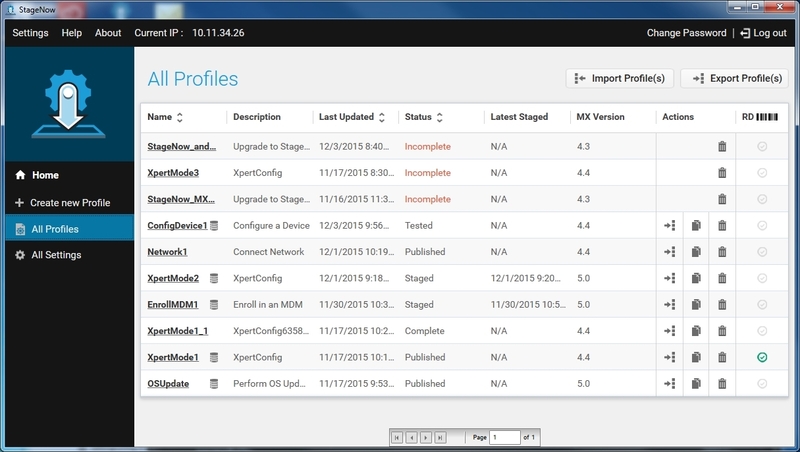 This window lists the available profile delivery types, and displays dates and times when the profile was Last Tested, Published and Staged. 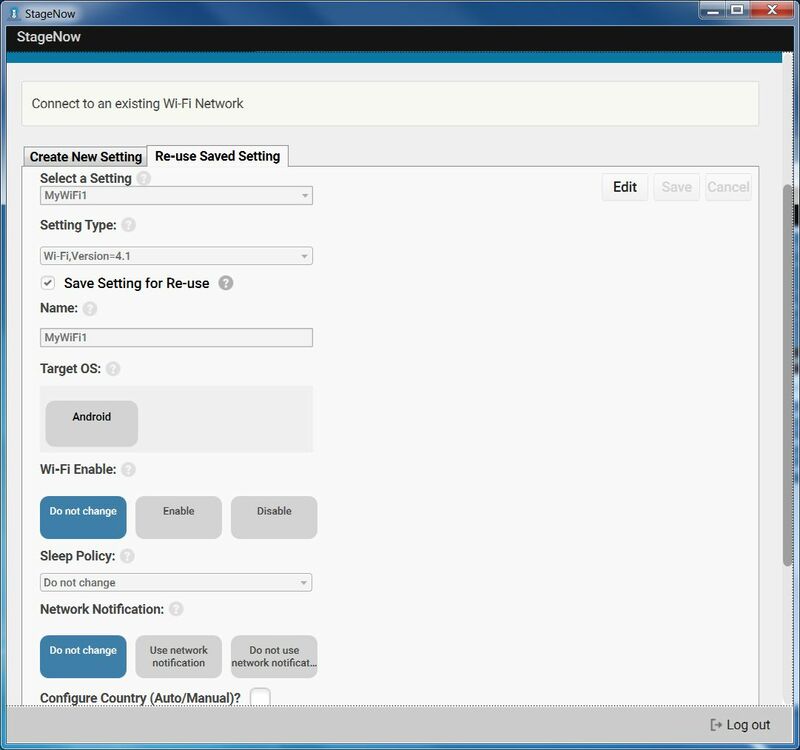 To create a direct connection via hotspot instead of using the configured staging network, check the "Yes, use WiFi Hotspot" checkbox. This allows staging with a single staging barcode without requiring an external Wi-Fi network, and eliminates the need for reprinting barcodes if there is a profile change. 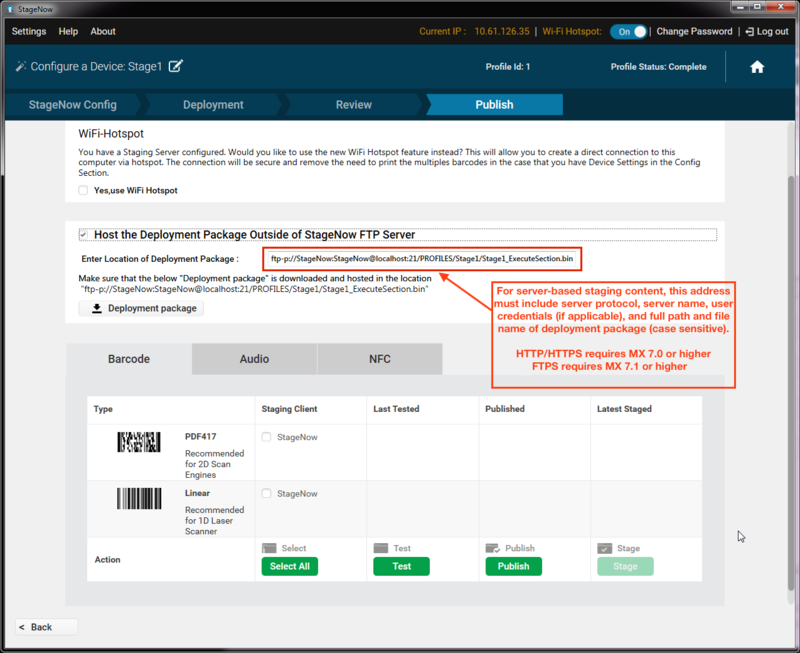 To stage devices from content stored on a server, check the "Host the Deployment Package Outside of StageNow FTP Server" and enter the server address and fully qualified file name (including path, see image above) of server-based content using the Source URI syntax. For more information and examples of this syntax, see the Source URI and Examples sections of the File Manager guide. This feature supports HTTP, HTTPS, FTP and FTPS (FTP over TLS or SSL) protocols and basic authentication of URL-embedded credentials (Devices with MX 4.4+ support FTP only; HTTP/HTTPS requires MX 7.0 or higher on device; FTPS requires MX 7.1 or higher). Select the checkbox for PDF417 or Linear to specify the type of barcode for deployment, or choose Select All to select all barcode types. Select Test to test the functionality of the profile before publishing. This generates a PDF of test staging barcode(s). While this step is optional, it is important to determine whether the profile functions as intended before making it available to the operator(s) for staging devices. If the staging material functions properly, select "Publish" to publish the material for operator use. Note that the administrator can choose to publish only certain types of barcodes that were successfully tested, and publish the others when they are ready. 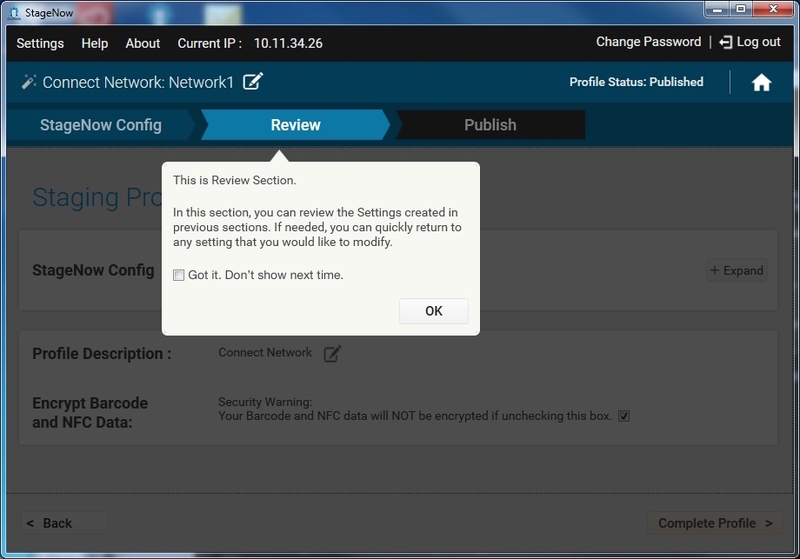 Select "Publish Now" to continue. 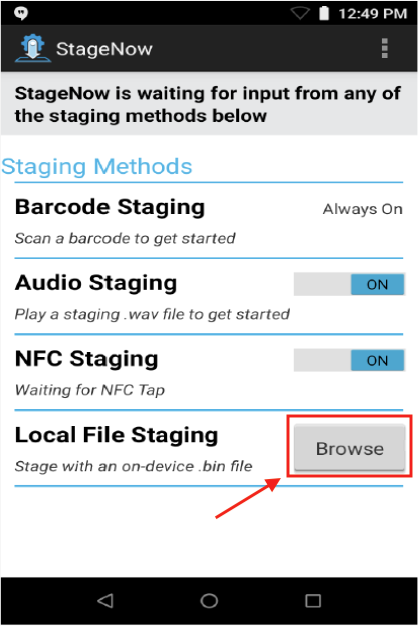 To make the profile available for staging, select "Stage" to generate a PDF of staging barcode(s) that devices can scan for staging. 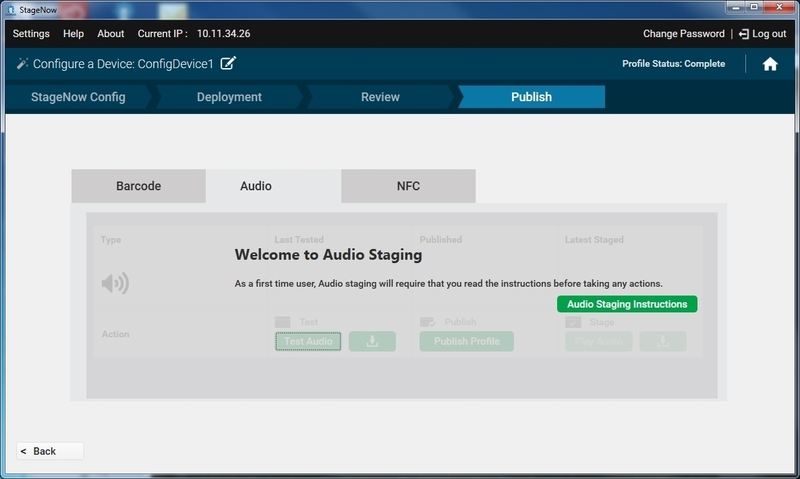 See Device Staging. 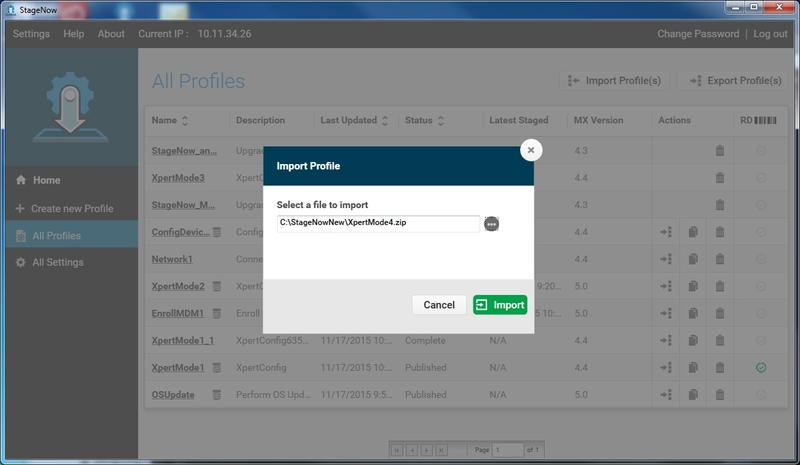 To export the profile for consumption by StageNow or an MDM, select the "Export For StageNow" or "Export For MDM" button. See Exporting Staging Profiles. 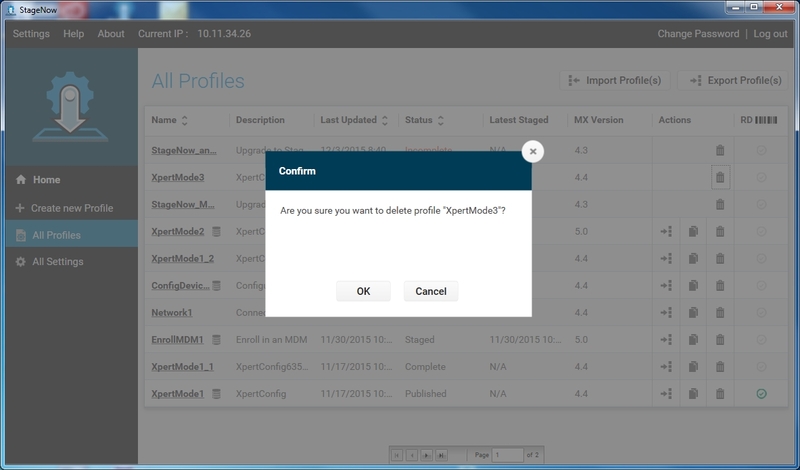 Select "Unpublish" to unpublish a profile and remove operator access. 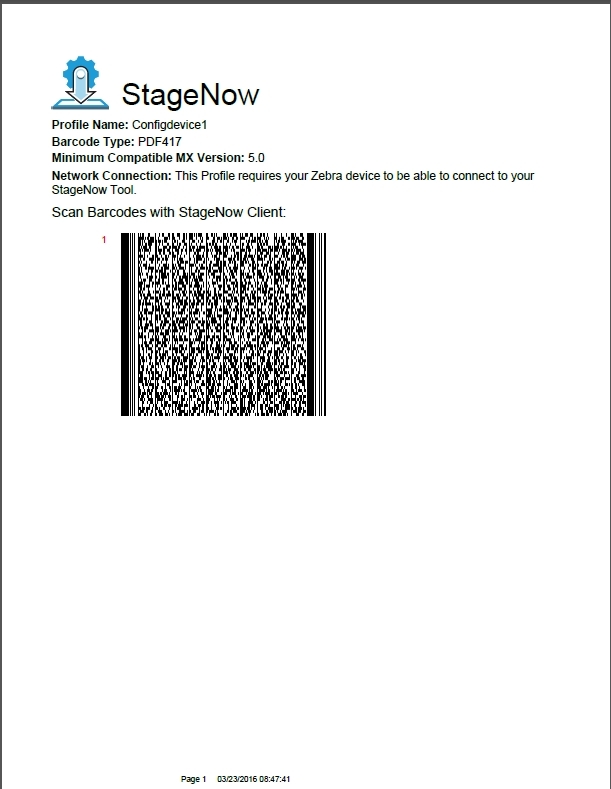 StageNow 3.3 (and later) allows the .bin file(s) generated during the NFC Staging process to be used for staging a device from a USB drive or SD card. Generate .bin file(s) using the NFC Profile Staging procedures above. Create a folder called /Stagenow on a USB drive or SD card. Copy the .bin file(s) to the new folder's root level. Attach (or insert) the storage device and boot the (new or enterprise-reset) device to be staged. When the .bin file is found, the set-up wizard is skipped and staging begins. Note: Staging profiles stored on an SD card take precedence over USB. Copy the .bin file(s) to any location on the device. 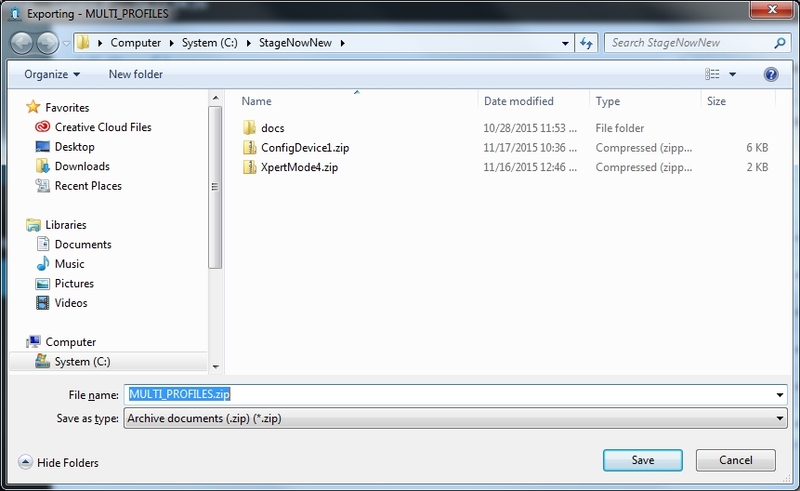 Navigate to and tap the .bin file copied in Step 2 to begin staging. 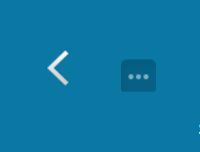 Select the Copy icon (shown below) next to the profile. 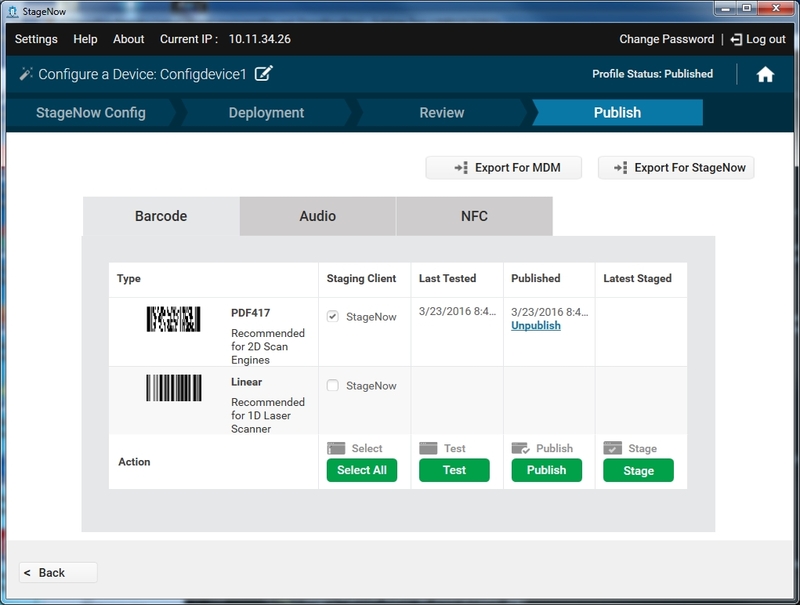 In the Review section, select Complete Profile to move to the Publish section to generate updated barcodes, NFC tags, or audio files. Navigate to the file to be imported and click "Import" button. 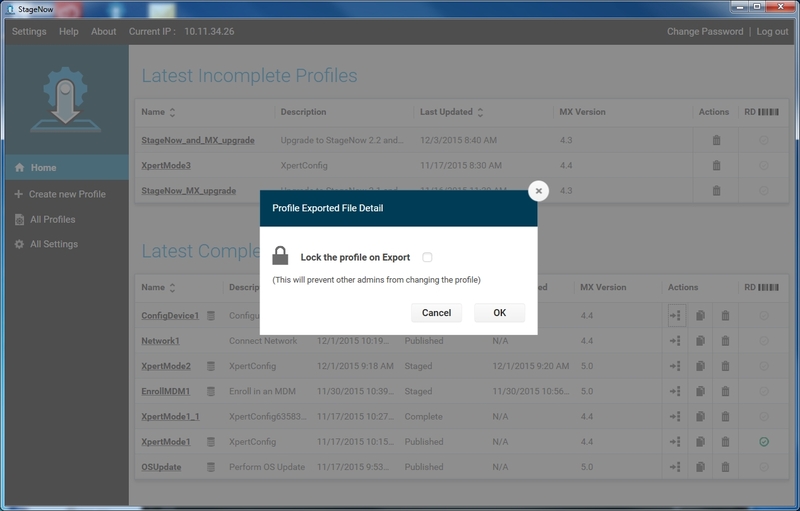 A dialog appears to indicate that the profile was imported successfully. IMPORTANT: After importing a staging Profile, its settings counters are reset to zero (see image below). Click image to enlarge; ESC to exit.